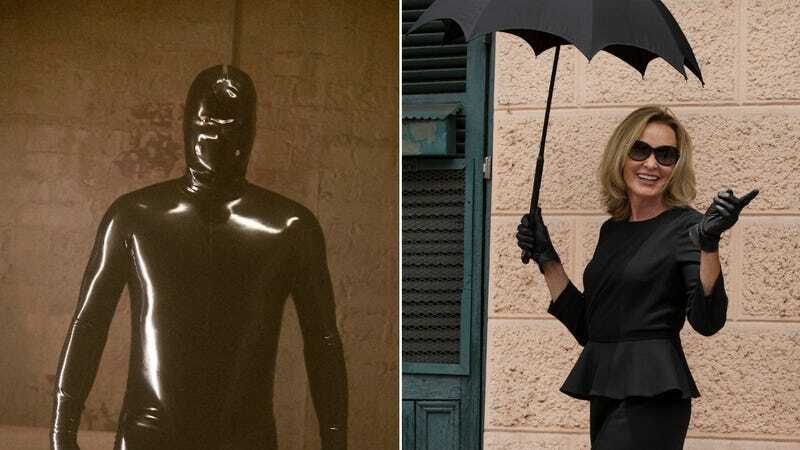 The Murder House season of American Horror Story was a lot of fun, right? It had a baby Antichrist, it had the Rubber Man, and it had a weirdly positive ending where everyone became happy ghosts. (There was also a deeply unfortunate school shooting plot because Ryan Murphy needs an editor, but we can ignore that.) Conversely, the Coven season was almost as far away as you can get from fun without being actively painful. It had fun elements, like Stevie Nicks and Danny Huston’s jazzman serial killer, but it also waited until the last moment of the last episode to become the show it should’ve been the whole time—specifically one about, you know, a coven of witches. Finally, after years of teasing, American Horror Story is doing a crossover between that good season and that very bad season, with Murphy announced on Twitter that season eight of American Horror Story will premiere on FX in September. Murphy tends to be frustratingly obtuse with his American Horror Story teases, so it is worth noting how oddly straightforward this announcement is. Maybe he’s counting the years of crossover promises as enough of a tease? Or maybe this is all part of some larger game, and the real terror of season eight is the unreachably high expectations of fans? If Murphy wants to teach everyone a lesson, he could just rehash the worst parts of Coven (which, again, was nearly all of it) and maybe we’d all start to appreciate stuff like the Hotel season a bit more—as difficult as that may be to imagine. Also, yes, Asylum was better than Murder House, but Freak Show already did an Asylum crossover.